I feel like I've mentioned this once or twice previously, but in case you didn't know, I'm going on holiday in less than a week. We are flying off to sunny Kos an island we have visited several times, and keep going back. This time we have upgraded and are staying in a more swish hotel then we are used to, which i'm so looking forward to, will be nice to have a little bit of luxury, we could both certainly do with relaxing, there is also a spa, so can anticipate a massage at some point. Anywho, on to my Holiday Beauty Essentials, and what I will be packing in my suitcase. For me holidays are not about getting glammed up, and clubbing, in fact the days I will be spending bare faced, except for spf, and as for the evenings I will add a coat of mascara and a bit of eye makeup, maybe lip gloss, for dinner and drinks. I rarely bother with foundation on holiday, I use it as an opportunity to let my skin breath. 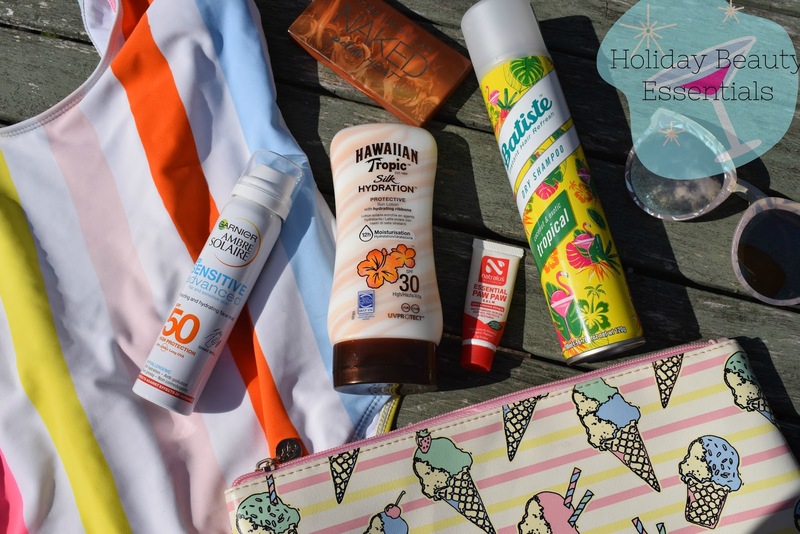 Face Spf is probably my number one priority my favourite is Ambre solaire sensitive hydrating mist factor 50 , a light mist that's not greasy and offers top protection. Sun cream is of course a pretty big essential for a hot country, I've picked up Hawaiian tropic spf 30 silk hydration, this stuff smells so good, and is light and moisterising on the skin. Lip balm with an spf is always needed on holiday, I don't think it really matters what one you get as long as it has decent protection. 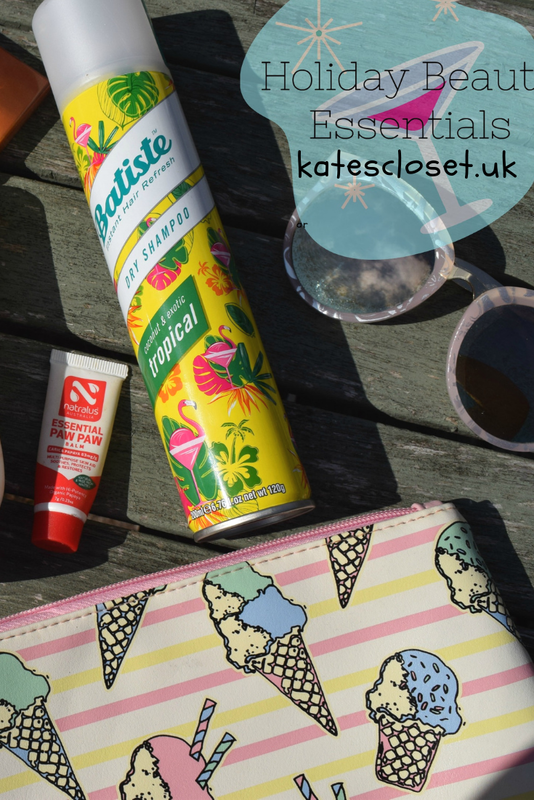 Greasy hair can be a problem on a day sightseeing, so a blast of dry shampoo is a must for sorting my locks right out, my favourite is Batiste tropical. 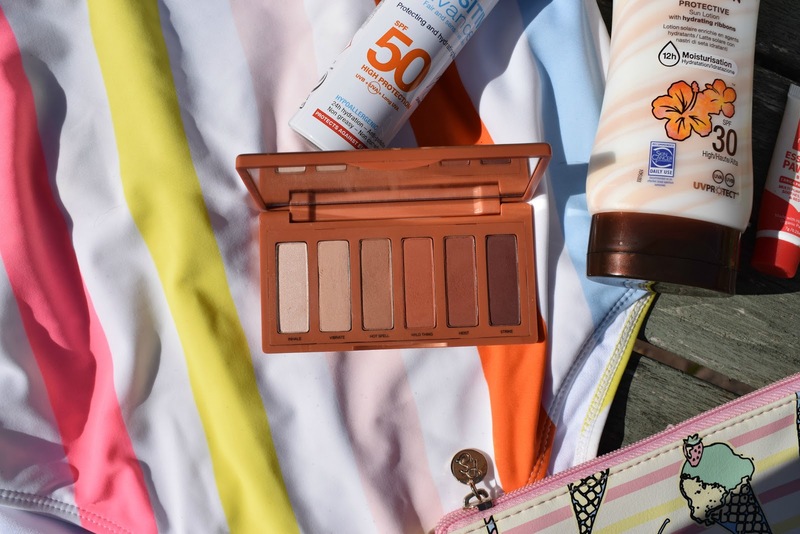 When it comes to makeup, I will not be taking much but something I will be taking is my trusty UD Naked petite heat palette, it has perfect summer shades and is compact for travel. I will also be adding some aftersun and some hair bobbles, I have to have my mop out the way in the sun. What are your holiday beauty essentials? That UD palette is so pretty! I use the same dry shampoo and they also have a travel size for the times I only travel with my hand luggage. Sun cream looks lovely! Hope you have a great holiday.